A little over a year ago I had never heard of Epidermolysis Bullosa -- or EB for short. Then my friend Becky gave birth to her second daughter, Elle. 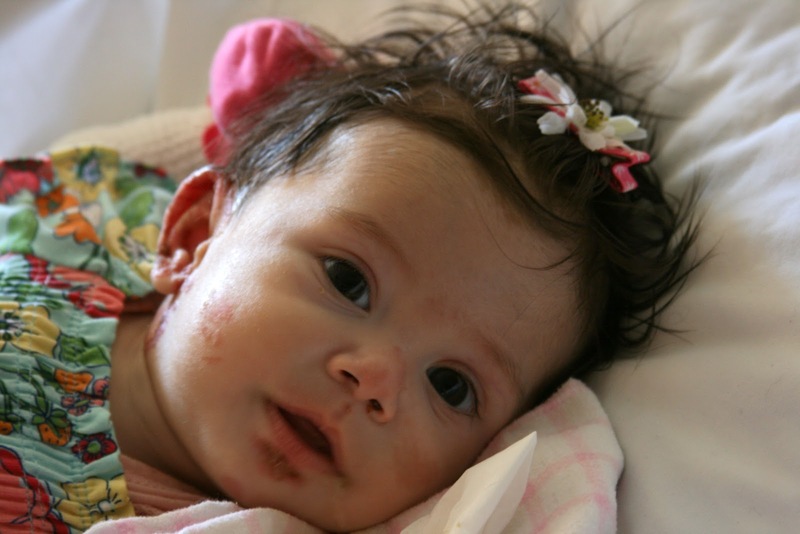 Within days Elle was diagnosed with EB, a genetic disease which causes the skin to be incredibly fragile. Basically your skin is held onto your body with a series of proteins. They work like velcro. People with EB are missing some or all of those proteins. For Elle the slightest touch can cause a blister. The elastic on diapers tears her skin off. She can't wear clothes with seams. Sucking on a bottle can cause blisters in her mouth and on her lips. But perhaps the worst part is that her parents can't pick her up and hold her very much -- even the gentle touch of a mother can cause blisters and bleeding. Children with EB are known as "butterfly children" because their skin is as fragile as a butterfly's wings. Elle has the kind of EB that also effects the dermis on all of her internal organs as well -- her esophagus, her trachea, the lining of her digestive tract. Children born with this kind of EB (known as "junctional") don't survive. When Elle was given her diagnosis, the doctors gave her two months to two years to live. But Elle is lucky! She is participating in a clinical trial at the University of Minnesota. Her family has temporarily relocated to Minneapolis for Elle's treatment. They are able to stay at the Ronald McDonald House, a place that provides them with housing, meals, entertainment, and support at a very, very low cost. Thirty-six days ago she received a bone marrow transplant from an anonymous donor (the goodness of strangers!). Hopefully this transplant will start to replace those missing proteins. This is her only hope. There isn't much research done on EB -- it is an incredibly rare disease. Until now, the only treatment was good wound care. But with this clinical trial, there is a glimmer of hope for families with children with EB. But the transplant doesn't come without risk. Right now Elle is a sick little girl battling infection, but she clearly has a strong will to live. If you are of the praying persuasion, would you pray for Elle, her family, and her doctors? And thank heavens for the Ronald McDonald House in the Twin Cities! Drop your change into the collection box next time you drive through -- they do incredible work at little or no cost to families. Bravo! Trumpette (the children's clothing company with all of the fun socks) has designed a pretty t-shirt covered with butterflies. The proceeds from the sale of this shirt go to benefit Elle's family and help them continue her treatment. You'll find it here: Baby Elle Butterfly Tee. Check out DeliciousBaby.com for more Photo Friday entries. wow - i had no idea that this even existed. i'll keep her and her family in my thoughts!